Was that a bear?? Nope. Just a stump. Poison Ivy? Poison oak? Poison sumac? Yep. How dumb is it that I just keep climbing mountains just to run down them again? Is that a snake? Yes. That actually is a snake. Is that Fireball on the aid station table? And Emergency Drinking Beer? Seriously? People are nuts. I mean, more nuts than I am for running these trails that obviously no one ever uses. Because…rocks, roots, ledges…yep, that’s why. Mile 40.5 aid station…I left the crackling fire, delicious food and light for narrow trail with barely any markings, rocks jutting out of the trail that were eager to trip me, a steep drop off on my right, some crazy bird that was squawking in the trees nearby (what kind of bird is that vocal at night? A rabid one, probably), and darkness (other than the light from my precious Petzl). I tried to put on music, but my headphones got tangled in my trekking poles and shortly after I started doing an uncoordinated spastic dance trying to free them, I quickly realized that I needed both eyes and all attention on the trail if I didn’t want to end up careening off the side of the mountain. So that was it for my foray into running with musical distraction. Then I hit a slick rock and ended up splayed out on the trail, my one and only fall of the race. I quickly assessed my situation and determined that I was uninjured and needed to get up and keep moving. At some point I saw it off in the distance…a dim light bobbing along through the darkness like a ghostly lantern. My heart lept. It was another runner! Woohoo! I would not be mauled by a bear at night by myself! I would be mauled by a bear in the presence of others! I approached and the man in the back asked if I wanted to pass. HECK NO! I’ll just stay back here, thank you very much! Eventually, it dwindled down to just me and one other runner, but I could tell that we were both committed to hanging in there with one another. Neither of us wanted to be out there alone and in the dark. When we rolled into the last manned aid station, I knew that I could not linger or I would never leave. Very Hotel California-esque, I know. A man shoved a cup of luke-warm chicken noodle soup into my hand, and I gratefully scarfed it down. We had just completed an incredibly gnarly section of trail, and it had taken me longer than any other grouping of miles the entire race (3 hours and 20 minutes for 7.5 miles) . I didn’t know how I could possibly be out there another 3-4 hours, but at this point quitting would hurt more, so I gave my running buddy a nod and we headed off onto the trail. Again. 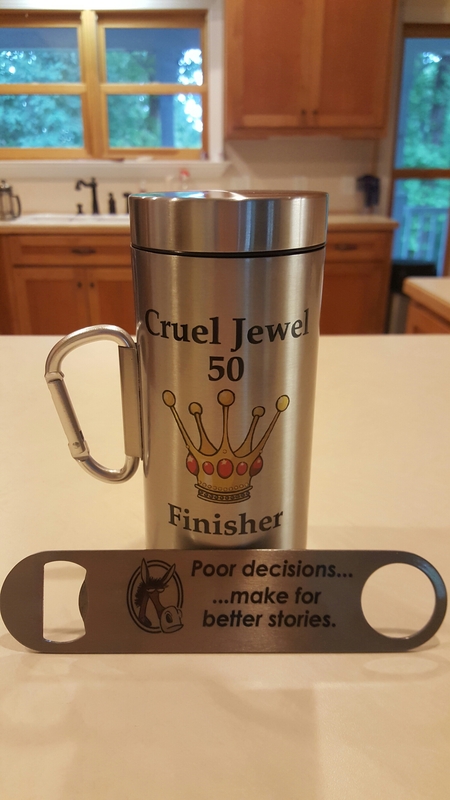 This entry was posted in fitness, running, Ultrarunner, Uncategorized and tagged Running, ultrarunning, mountain running, trail running, ultramarathon. Bookmark the permalink.